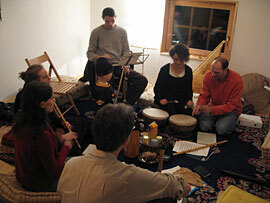 The makamhane organizies several times the year workshops with mastermusicians. The aim of these workshops is to give opportunities to musicians and amateurd to get professional lessons on instruments like Ney, Ud, Darbuka or klassic turkish singing, so that acquires knowledge and knowhow which can be deepen through mastermusician-lessons. 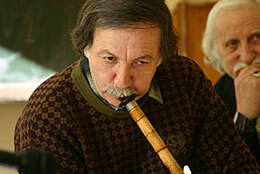 to garant the optimal quality of the lessons, we often invite Mastermusicians from foreign countries. Most of the workshops are taking place at the locations of the makamhane. The workshops last from 1 to 6 days. 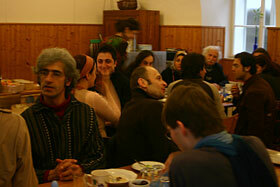 The language in which the lessons are been hold are english or german or we provide a translation directly. The makamhane evokes beside the support of musical lessons relaxed und communicative atmospheres, which are strengthed through mutual musicplaying and talks by common meals and tea breaks. The existent networks between teachers and students through international particapions in workshops show a alliance of art and understanding which helps to develope a global and intercultural awareness in this world of plurality and diversity. A essential matter of interest of the makamhane ist to help amateurs and music interested persons to come to a basical contact to different kind of instrumental tradition, and to learn such a musicinstrument from the beginning under the the eyes of mastermuscians. To give Musician who live in vienna, also the opportunity to teach through their way of art, the room of the makamhane is prepared for their work their. contents: posture, breathing, basic technics, musical notations, Makam-theory, Repertoire, improvisation. for beginners, contents: posture, basic technics, musical notations, Makam-theory, Repertoire, improvisation. for beginners, contents: posture, basic technics, repertoire, improvisation. 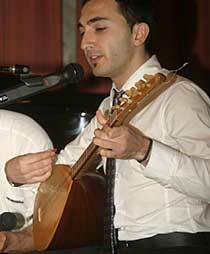 The Setar is one of the classical string instruments of the persian culture field. 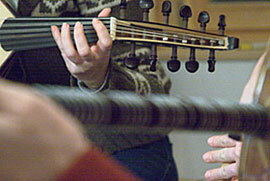 Se -tar, the three strings of the lute are been played with extraordinary finger technics and splending sound elements. To strength a better understanding for Maqam-Music also on the theoretic level and to support students for a good based curriculum the makamhane organizes two times the year lectures about Maqam-Theory. Importend is hereby to invite mastermusicians and experts to transmite the many details which can only be known through much experience and lessons. The rehearsels which are open for everyone and are free of charge give the opportunity to meet each others and to share the love for music. 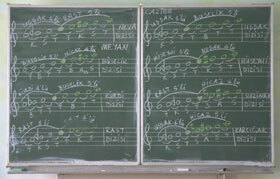 Students of maqam music can use the rehearsels for accomplishing their knowledge on this field . People who have no musical background, can also find an easy way into playing music which others, and to choose an instrument which they want to learn. Everyone is invited to sing, beat the drums, or to bring some compositions or just to listen music which is sometimes older than 350 years. A big repertoire on notes and audiotracks is also useable by the rehearsels. 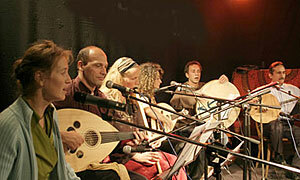 The "Ensemble makamhane" was founded my members of the makamhane on may 2005 and invites often sidemusicans to concerts. The ensemble is suitable for creating interests for the classical eastern music and presents on stage mostly the ottoman-turkish classical style extended with dervish music and centralasiean folksongs. Lectures which give an inview to the cultures of the near and middle east, specially the traditions of music and literature, and the opportunity to hear classical masterpieces of poetry are combined with meetings of invited scientists and artsist in their mainfield of research and experiences. every two weeks , on tuesdays between 19.00-20.00, details on our news site. 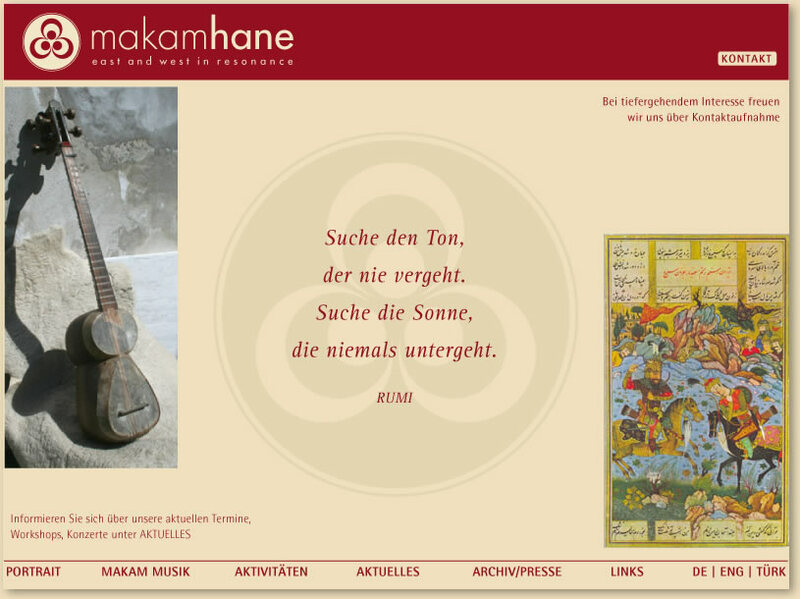 Members of the makamhane have given an order to create an Open-Source programm by "Lilypond“ for using the special notation and sounds (MIDI-microtones) for classical ottoman-turkish music so that the pieces can be heared for practising a repertoire. The programm allows to create any kind of microtones. Lilypond can be used under Linux, Mac OS X, BSD and Windows. The installation of this "sponsored feature“ (http://lilypond.org) is been payed by some musicfriends, the Institut for Musicology of the University Vienna and the makamhane. It is free of charge useable for everyone. Courses in persian, arabic, turkish and german on the basic of daily talk are with the same breath an open field of entering the high literature. This are the main ambitions in this projects.